Pollischansky Verlag (Austria); First & oldest work & specials! Pollischansky Verlag was an active printer. 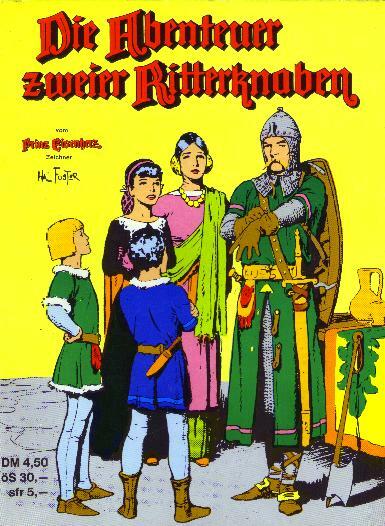 From 1970 till 1991 they publish no less then 5 different Prinz Eisenherz series. For a lot of people all these series are very confusing, therefore I start with an explanation for each serie. See for each serie the special paragraph. Serie 1: The old work & specials. Pollischansky Verlag started with reprinting the old work from Badische Verlag (see their paragraph). This reprint of page 1-879 in black & white is published between 1970-1975 in 6 books. See below on this page. Serie 2: The normal series. Between 1975 and 1985 they publish page 880-2553 in full color in 43 books. Because of the first 6 books in black& white (serie 1) these books are numbered 7-50. There are two prints of at least the first 26 books. Unfortunally this has resulted in different frontcovers for both prints. Serie 3: The Sonderband ausgabe. 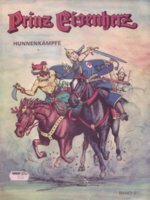 From 1975 to 1980 Pollischansky decided to reprint the first 6 black & white books (serie 1), but now in full color and in a normal comic book amount of pages (48). This resulted in the Sonderausgabe, book 1-16. Allthough there are more books (as in serie 1), we still talk about the 1-879 plates. There is only one print, lucky enough! Serie 4: The goldene ausgabe. Between 1983-1985 Pollischansky did publish 5 books in the Goldene ausgabe. These are reprints of the first years of Prince Valiant, in a special edition and in color. Serie 5: The comic Gallary. Pollischansky Verlag started with reprinting the old black and white pages in the Comic Gallary serie (printing between 1977-1991). There are 12 books, each book containing 1 annual year of Sunday pages, starting with 1937. 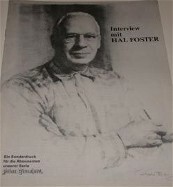 This is the 1st serie of Pollischansky; the Oldest ausgabe. This serie is published between 1970 and 1975 and include the plates 1-879, but in black & white, in 6 volumes. These are direct reprints of the old work from Badische Verlag (see their paragraph for more information). Value around 40 Euro for each book. A: Abenteuer zweier Ritterknaben The mediaeval Castle was renamed "Abenteuer zweier Ritterknaben" and printed as a special book in full color. Printed in 1985. Value of 10 Euro. B: Sonder druck 1 was printed in 1974. It 's called "Wissenswertes über den Ritter ohne Furcht und Tadel" (Things to know about knights without house and lord). It's a magazine like book. Value Euro 40. C: Sonder druck 2 was printed in 1975. It's called "Interview mit HAL Foster". Value Euro 40. D: Sammelband Pollischansky did print at least one "sammelband" (alltogether volume), containing the original volumes 3,4,5 and 6. I presume they did mean the original volumes of Badische Verlag (see their chapter). This band is called "Der Ritter ohne Furcht und Tadel". Value is around 15 Euro. E: The song of Bernadette This is a very special reprint of Hal Foster's Song of Bernadette (after the Roman of Franz Werfel). Very rare oblong book (black & white), value is around 50 Euro, printed in 1978. Two languages (Eng/German). F: Special book for subscription holders This book contains 3 Foster drawings in original size. Published 1971.Euro 25.